The curtain rises in only a few hours and I’ll be heading to the Queen Elizabeth theatre shortly to begin tonight’s coverage of Blogger Night at the Opera for Rigoletto. In the meantime, check out the Vancouver Opera’s blog as they have some great interviews and behind-the-scenes photos leading up to tonight’s performance. Update: Tom Wright, Director of Artistic Planning at the Vancouver Opera met us as we set up our laptops in the lobby of the theatre in preparation for tonight’s performance of Rigoletto. He guided us backstage — as well as up onto the raised stage — for a tour, with just an hour to go. I had a great photo of the props table and “Duke’s Throwing Goblet” but with the low light many of my frames were too blurred to published. Regardless, here are a of couple shots form the tour. 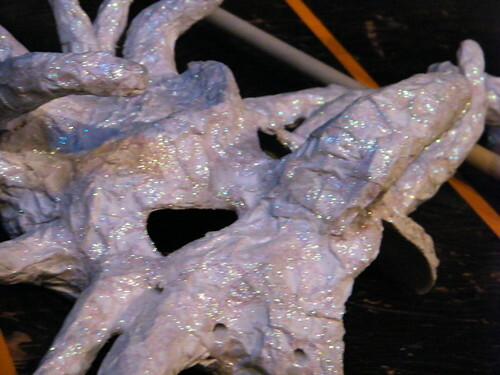 Rigoletto is Giuseppe Verdiâ€™s dark, powerful story of treachery and vengeance. Rigoletto is a jester in the court of a womanizing Duke. When his jokes go too far, he becomes the subject of an angry Countâ€™s curse. His beloved daughter, Gilda, is kidnapped by the Dukeâ€™s courtiers and Rigoletto swears revenge. The jesterâ€™s plan goes wrong and Gilda pays the price with her life. This emotional and haunting production, conceived and directed by Glynis Leyshon, features an imaginative set design by Bretta Gerecke. All of our updates and blog posts (there’s about six of us here) will be posted to Twitter as well. We’re getting some wonderful questions and comments about the online realm and its interest in the opera and as one passer-by mentioned, “well you’re not drinking wine so you’re not truly experiencing the opera!” We’ll have to remedy that situation, certainly. Another patron just asked if he could peek behind us while we’re typing, he then asked for us to write about what he was doing. The result? Tanya has a hilarious transcription of his banter including, “I’m not really sure why I’m here at all – oh I know, it must be for the circus.” He also just told us about his friend’s production, which we read up on at TheDreamHealer.com. 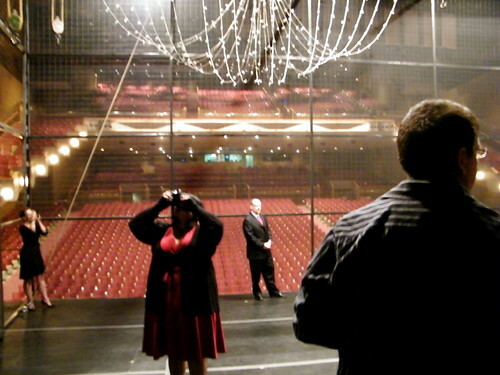 Backstage, Wright commented on how the set looked more like Cirque du Soleil meets the opera which, by looking at all of the props, rings, rope ladders and masks, may be spot on, we’ll see. Christopher Libby, the Managing Director just came by to make sure we were taken care of and welcomed Tanya, Kimli and I back (since we were also at Carmen. Update: As usual, my full review will follow later tonight once I’m back home and right now I’ll share more immediate thoughts. This is the only intermission we have during Rigoletto and I think we’re all blown away by the vocal capabilities of Eglise Gutierrez, who plays Rigoletto’s daughter, Gilda. I heard several people shout “Bravo” multiple times, it’s rather breathtaking. The other item to note is the set design, it’s full of ropes, cables, and is elevated above the stage, allowing for the darker underside to be used within the story as well – it’s very unique and really aids in turning what one would think would be a jovial tale into one of trickery, betrayal, deceit and practical jokes. It was a pleasure to see Sheila Christie, playing Giovanna, and the comments out in the lobby right now are wonderful. Tanya’s had two people come up and share their insights about the story so far and we were just visited by Karen Hamilton of TinyBites.ca who is here to enjoy the show as well as Gung Haggis Fat Choy. I was also recognized in the theatre as being “the girl with the computer”. Update: I’m back home from the opening night party and the opera-recommended parkade in which I parked the car (long story, but I have a car for the night) was only $6 for the entire evening and very secure. Following the ovation we gathered in the lobby to discuss Rigoletto and I heard Tanya mention that it wasn’t what she expected (after not reading the synopsis) and she was very pleasantly surprised. I would have to agree. Save for the cheeky and sultry beginning, Rigoletto toils with revenge and anger with laughter being the furthest thing from his mind. He is Crime, and I am Punishment. This is no night at the circus, despite the clowns who dotted the landscape as quiet observers, and it was great. Compared to my other experiences at the Vancouver Opera this season, the set was definitely different in style and form but it was certainly striking — I particularly enjoyed the lighting. Many were asking how it fared after our time spent at Carmen and I have to say that the productions were so different and amazing in their own right. The power of Carmen combined with its familiarity was marvelous however there were moments at Rigoletto where I seriously wondered how it was humanly possible to have voices that could capture such emotion with such a vast range. I’ve known for months but yet again it was confirmed that the staff and supporters of the Vancouver Opera are all really great people who care so much about each production and the enjoyment of all. A big ‘thank you’ goes to Ling and Selina, every Vancouver Opera member who welcomed us this evening, and my fellow bloggers Kimli, Tanya, Monique, Tris, and Miranda. I’ll try to link their posts here once complete along with more photos as they come up online (such as Tris’ set on Flickr). Thanks for the mention of the visit. And while we were chatting about the Canucks… did you ever check the score? Sorry I didn’t ask you after the opera. Sorry, I didn’t introduce you to some of my friends in the opera chorus, and concert master Mark Ferris. His wife looks after the CBC BC website. Lots of good net connections abound! Glad you enjoyed Rigoletto… must go write my review now too! Rigoletto is an opera in three acts by Giuseppe Verdi. The Italian libretto was written by Francesco Maria Piave based on the play Le roi s’amuse by Victor Hugo. It was first performed at La Fenice in Venice on March 11, 1851. It is considered by many to be the first of the operatic masterpieces of Verdi’s middle-to-late career. 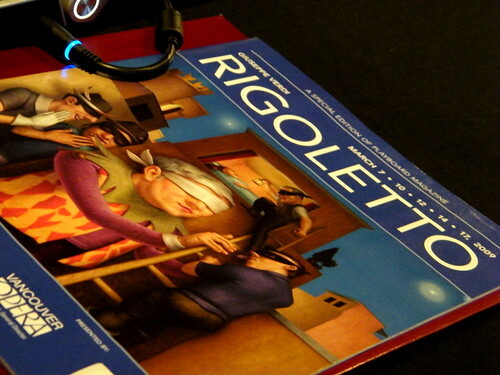 Thank-you for your post about Rigoletto and the notification about the two-for-one deal. I shared a beautiful night at the Opera with my wife and we’re looking forward to the next performance.